Margerie Glacier is the most famous glacier in the park. Whilst observing the glacier you’ll hear the white thunder and constant creaking of the glacier. Huge chunks of ice are constantly dropping from the front of the glacier, photographers must be quick to get a snap of the falling ice. Some guys are able to make use of the icebergs that are falling from the glacier, this gives you a good idea of how big the falling ice is and why you hear white thunder when it drops. What is more rewarding, viewing a sea lion in Sea World, San Diego, or viewing a sea lion in its natural habitat. 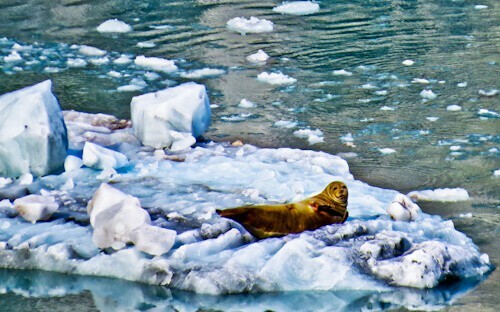 This sea lion sure is enjoying a lie down on the floating iceberg. The part of the glacier which we are looking at is the end of a 34 km long, 1.6 km wide tidewater glacier. It starts at nearly 4000 meters on the slopes of Mount Root which is at the US / Canada border. A tidewater glacier is one which ends at the sea. Margerie glacier is only accessible by sea or air, you cannot hike to this glacier. Glacier bay is actually a 100 km long fjord with several glaciers reaching it. Back in 1750 all the bay used to be one big glacier but due to higher temperatures in recent centuries and less snowfall there are now several smaller tidewater glaciers all ending in the fjord. 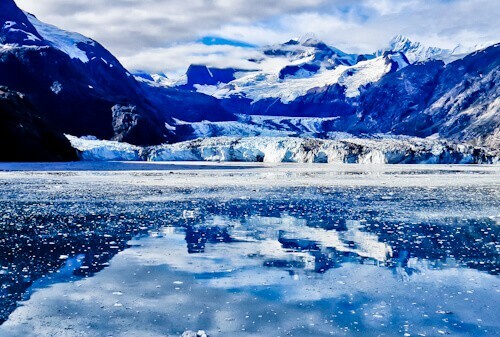 If you hit glacier bay on a sunny day you’ll be rewarded with thousands of perfect glacier photos, amazing reflection photography, mountain photography and even sea lions sun bathing on icebergs. Whilst experiencing your glacier cruising it’s important you get your photo in the bay as evidence you’ve been. 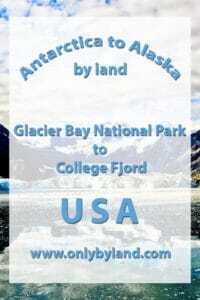 The next destination on the Prince cruise is College Fjord which is an overnight trip. I was very lucky with the weather in Glacier Bay National Park as I was soon to find out in College Fjord. 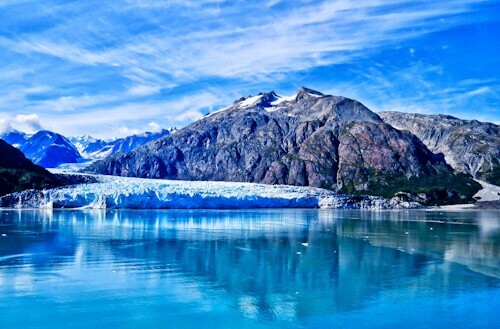 Weather can drastically effect your glacier bay experience. Whilst experiencing your glacier cruising it’s important you get your photo in the bay as evidence you’ve been. haha exactly what i think when i get to all the gorgeous places but some days im not photo ready so feature strangers! Alaska was already high on my must-see list, but now I am totally sold. The sea lion on the iceberg is such a cool sight, but sad that it is made more possible by climate change. Margerie Glacier is especially spectacular and photogenic. So much blue in there. Really wonderful spot. Did you get any pics of the ice blocks falling off. Glacier Bay National Park is so beautiful but I’m not sure if I’d be able to handle the cold as I’m used to warmer climates. I’d love to see bears, wolverines and sea lions in their natural habitat though. Simply beautiful! I would have loved to see more photos made by you from this place. Glacier Bay National Park is so beautiful but I’m not sure if I’d be able to handle the cold as I’m used to warmer climates. Love the photo with the sea lion. Looking at these photos, this place can’t be real. The Margerie Glacier is absolute beauty! It’s amazing how much beauty there is!! I have never been to a fjord! Hope to get to Alaska soon. 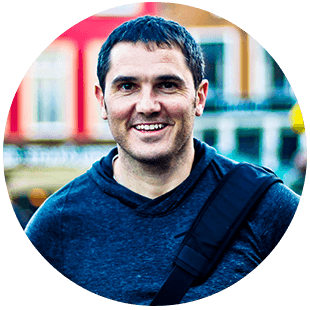 Is there a travel company you recommend? Watching Polar Bears and Sea Lions in their real environment is such an incredible experience! 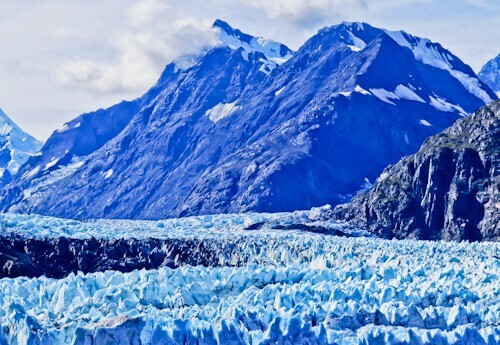 The azure blue pictures of the Glacier are so inviting and haha great proof of your visit to the Glacier park :). Anyways, sad to hear about the glaciers melting due to the global warming, if only there was a way to save these natural wonders. This might be the most beautiful national park. The glaciers remind me of Jokulsarlon in south Iceland, although I did not see any sea otters or other animals floating amongst the glaciers at Jokulsarlon. Your posts have been giving me serious travel envy! Alaska has been on my bucket list for years. I’d really enjoy the glacier viewing! 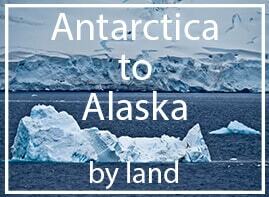 Alaska is a destination, so far from home, but high on our bucket list. For now we can only dream about going there, and read blogs about it 🙂 Thanks for sharing and have a great weekend wherever in the world! I will be in USA in 10 days I wish I had seen this post earlier. Glacier Bay National Park looks so good. Your pictures are stunning. Those photos are simply incredible man, they barely look real. You’ve easily convinced me that this is somewhere I need to go ASAP! This is incredible! The Blue glaciers look surreal. I cannot imagine what the scene would be like in real if the pictures are so astounding! And those sea lions! Super cute! I LOVE this post! You bring the whole experience to life with the imagery of the white thunder. I want to get to glacier Bay NP so badly! Hope I can make it happen soon, but until then I might come back to this post and live vicariously through you! 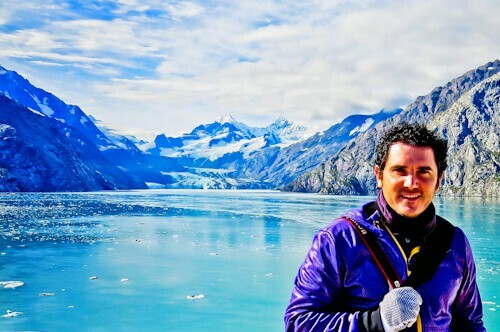 Glacier Bay looks incredible James! I’m not a big adventure sports kind of person, but honestly, I’d love to try kayaking here! How lucky you were that you had good weather during your visit. I can imagine it would have been a totally different experience otherwise! What a marvelous natural feature! James, you are so lucky to have seen this for yourself! I’ve seen so many photos of the Glacier Bay National Park that I wanted to go so bad. Your photos are equally breathtaking!